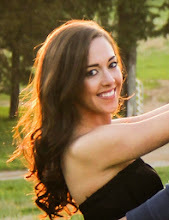 Last summer, I began my first clinical placement in my graduate program. Before seeing my very first real-live patients, I remembering feeling so nervous that I felt sick to my stomach. Who put the trust in me to do this?! I don't know what I'm doing! What am I going to say?! Will they know that I've never done this before? That first night was a bit of a blur due to my nervousness, but I know that I walked in trying to appear 100x more confident than I was. Later, I relayed how nervous I was to my more experienced coworker, who was working alongside me that day. Her response? "I had no idea you were nervous at all!" She told me that, in fact, she was shocked at how calm I was for my first day. In turn, I was surprised, thinking that my nerves had to have been palpable. I realized that my strategy of at least trying to appear confident had worked! I think this is something I do more often than I even realize. In both my current and previous research positions, I am often in meetings with *important* people (at least, in our field), and inside, I'm usually feeling like an idiot -- worrying about saying something stupid, not understanding what someone is talking about... I'm not the only one, right? But, I have realized that if I just pretend that I'm feeling totally comfortable and at-home, it just might make others believe it! Now, that doesn't mean pretending that you know what you're talking about when you don't (that will just get you into trouble) -- it's just about showing a bit more certainty than you really feel. You may not be an expert, but you did something to be where you are - just be cool! Fake it 'til you make it! I do the same thing in the kitchen. I'll throw in a little bit of this, a pinch of that - never mind if those flavors are "supposed" go together. If it sounds good, chances are, it might be! I don't use recipes very often, and that's not because I'm an expert chef - it's because I'd rather figure it out as I go. Just acting like I know what I'm doing, even if I don't really know how it's going to turn out, makes for more exciting and rewarding cooking experiences. The worst thing that can happen is that it won't work - and that's okay. But sometimes it turns out great! Like this dish. 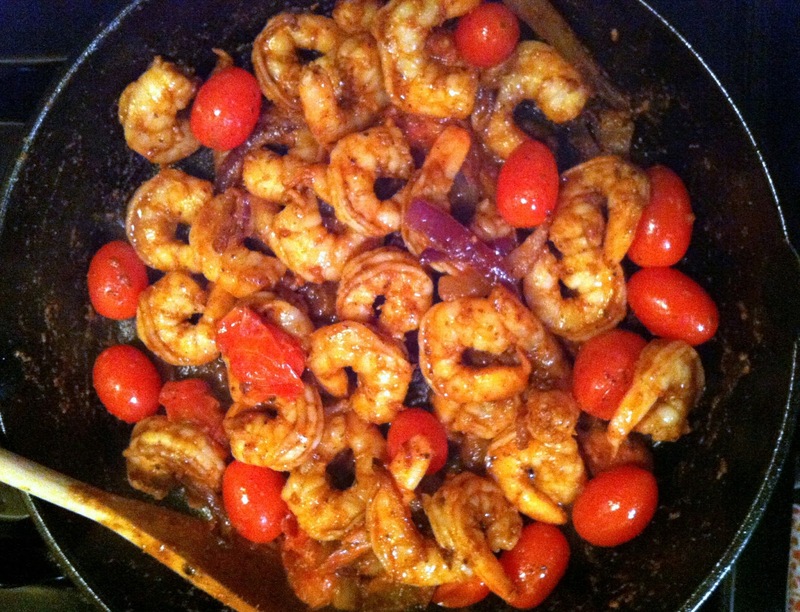 I'll call it...Cajun Shrimp & Vegetable Sauté. It came together out of nowhere, based on what caught my eye in the fridge. The shrimp is coated in Cajun seasoning and Old Bay, then tossed with rich caramelized onions, garlic, juicy grape tomatoes, & peppery arugula. Do all of these ingredients go together traditionally? I don't know! But it tasted freakin' awesome, that's for sure. It comes together quickly, and can be served with toasty bread or over cheesy grits. Check out the recipe after the jump. 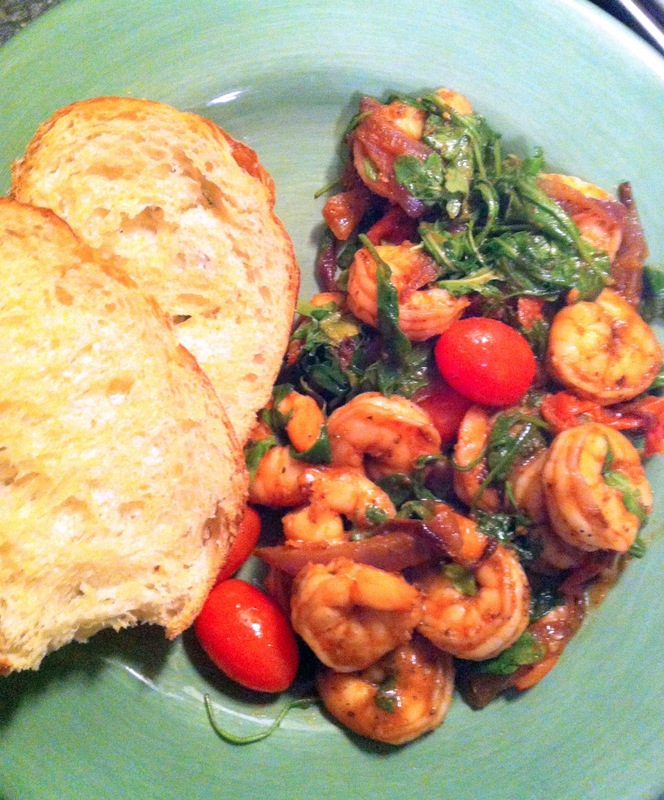 You'll need about a pound of raw, deveined, peeled shrimp. I buy them frozen with the tail on, then remove the tail once they're thawed and before cooking. But, you could also leave the tails on if you want the dish to appear a little fancier ;) Remember, we're pretending like we know what're doing here! 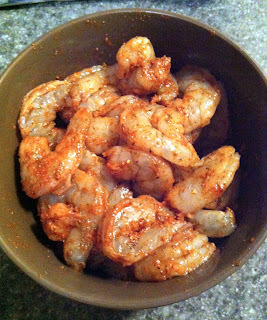 Mix together 1 tbsp of Cajun seasoning with 1 tbsp of Old Bay. I use Joe's Stuff, an awesome Cajun seasoning that I bought in New Orleans, but if you don't have any, a simple Cajun mix is also easy to make. It's pretty much just paprika, cayenne, garlic powder, salt, and pepper. Google it! Then toss it with your shrimp. 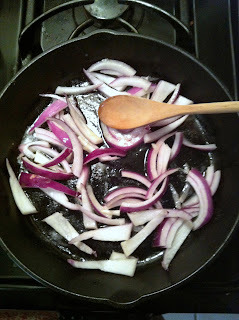 Now, we need some chopped red onion. Maybe 1/4 - 1/2 of an onion or so, depending on the size. Melt 1 tbsp of butter and 1 tbsp of olive oil over medium heat in a cast-iron skillet. Once hot, add the onion. 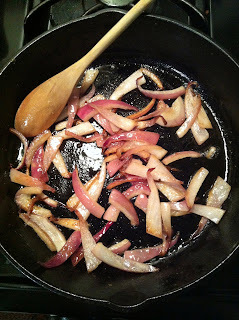 Cook for about 15 minutes or so, stirring occasionally (but not constantly - you have to let the onion stick to the pan a bit in order to caramelize). Be careful not to let burn. Once it's soft and smelling sweet, add in 1-2 cloves of minced garlic and stir until just fragrant (about 30 seconds). Then toss in a handful of grape tomatoes. Cook unti the tomatoes start to blister, about 5 minutes. 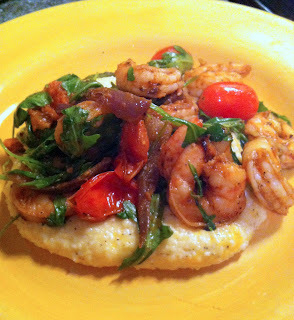 Then, add your shrimp. Cook until ALMOST opaque but still a tiny bit translucent - about 2-3 minutes. Lastly, toss in a few cups of arugula. Season with salt and pepper and cook until just wilted - about 1 more minute. Now eat! 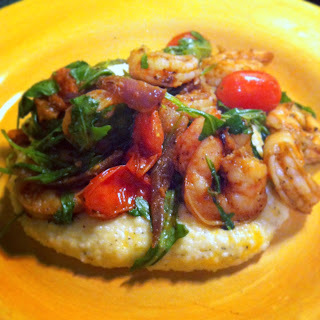 I had it over some cheesy grits (YUM), but if you're a freak who doesn't like grits (*cough* my boyfriend *cough*) then you can serve it with some crusty bread or rice. 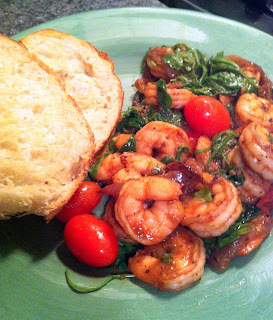 -Heat butter and olive oil over medium heat (a cast-iron skillet will work best). Add in onions and cook until they begin to caramelize, about 15 minutes, stirring occasionally and being careful not to let burn. -Add in minced garlic and let cook until fragrant, about 30 seconds. 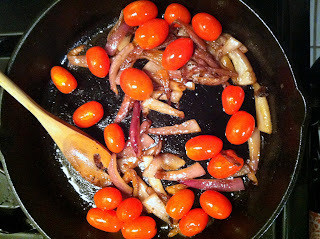 -Toss in tomatoes, and cook until they begin to blister, about 5 minutes, stirring frequently. 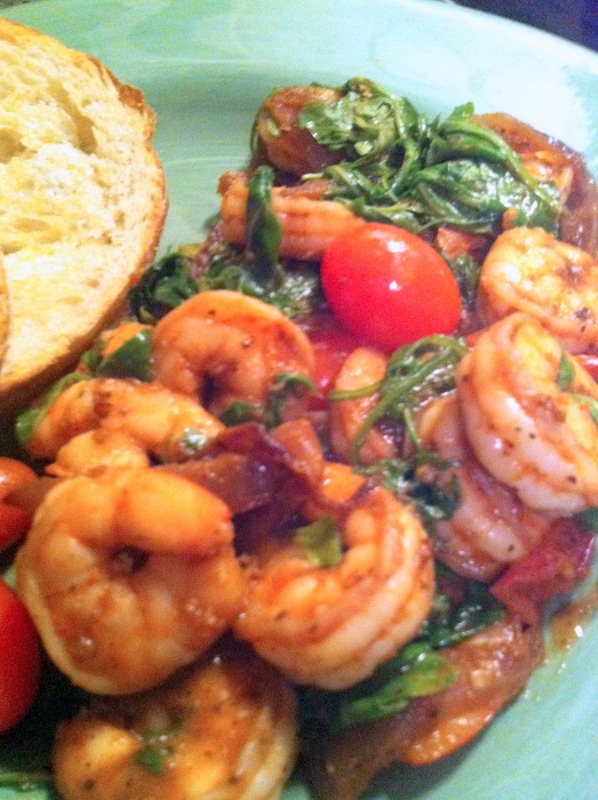 -Add shrimp, and cook until almost opaque but still a bit translucent, about 2-3 minutes. -Add in the arugula. Season with salt and pepper. 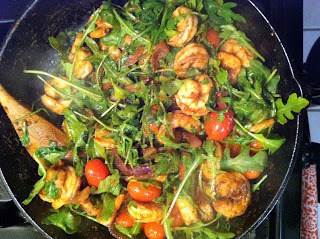 Cook until arugula is just wilted, about 1 more minute. What a wonderful post! And a terrific blog in general! Can't wait to follow what you're doing in the kitchen :) Love this!